Cartoons and rants from Isy’s life of late. Dominated by tales of wonder and woe frrom her travels in America last year that include a very flatering portrayal of Ramsay of PM Press. Isy claims her zine is cartoons and rants, but in this issue, there's less ranting and more just having fun. Isy is from the UK and most of this issue are her comics about coming to the US. She does a fair amount of biking in Portland, and gets to hang out in a cowboy bar, so pretty much a full American experience. 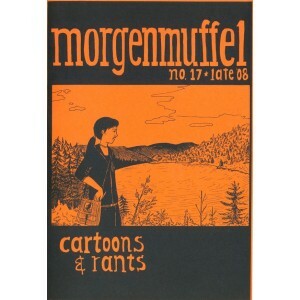 Morgenmuffel is generally charming, and this one may be more so than usual. In this one she goes line-dancing and sees bears. Some very cute personal comics. This issues includes tales of Isy's travels in the USA, more hate lists, a tribute to recently deceased US anarchist prisoner Harold Thompson, and information about charting menstrual cycles. The illustrated list of "strange German words" on the back cover is also very interesting and rad.